Form 3762 is a Michigan Department of Treasury form also known as the "Quarterly Certification Of Compliance By Nonparticipating Manufacturer (npm)". 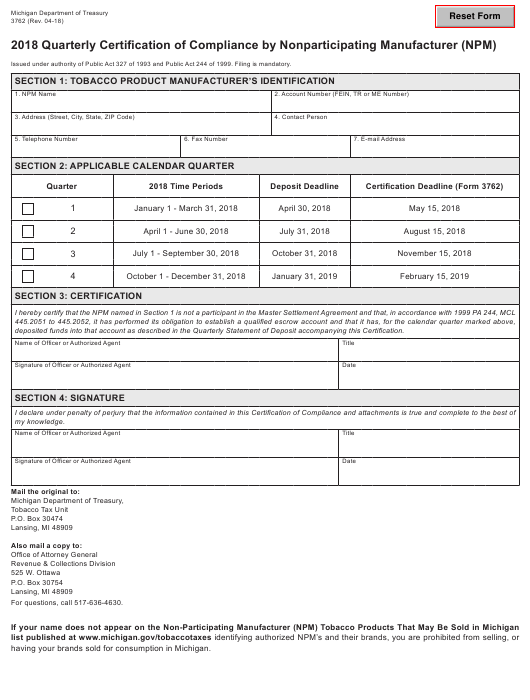 The latest edition of the form was released in April 1, 2018 and is available for digital filing. Download a fillable PDF version of the Form 3762 down below or find it on Michigan Department of Treasury Forms website. Issued under authority of Public Act 327 of 1993 and Public Act 244 of 1999. Filing is mandatory. deposited funds into that account as described in the Quarterly Statement of Deposit accompanying this Certification. having your brands sold for consumption in Michigan.